Event starts 2019/04/23 8:00 AM. You have 1 days, 8 hours, 59 minutes and 52 seconds left before the race starts!! You have 5 days, 8 hours, 59 minutes and 52 seconds left before the race starts!! You have 6 days, 8 hours, 44 minutes and 52 seconds left before the race starts!! You have 12 days, 8 hours, 29 minutes and 52 seconds left before the race starts!! You have 12 days, 8 hours, 59 minutes and 52 seconds left before the race starts!! You have 19 days, 8 hours, 59 minutes and 52 seconds left before the race starts!! You have 21 days, 8 hours, 59 minutes and 52 seconds left before the race starts!! You have 26 days, 8 hours, 59 minutes and 52 seconds left before the race starts!! You have 40 days, 8 hours, 59 minutes and 52 seconds left before the race starts!! You have 40 days, 9 hours, 59 minutes and 52 seconds left before the race starts!! You have 41 days, 8 hours, 59 minutes and 52 seconds left before the race starts!! You have 47 days, 8 hours, 59 minutes and 52 seconds left before the race starts!! You have 48 days, 7 hours, 59 minutes and 52 seconds left before the race starts!! You have 54 days, 7 hours, 59 minutes and 52 seconds left before the race starts!! You have 55 days, 8 hours, 29 minutes and 52 seconds left before the race starts!! You have 73 days, 8 hours, 2 minutes and 52 seconds left before the race starts!! You have 82 days, 8 hours, 59 minutes and 52 seconds left before the race starts!! You have 82 days, 21 hours, 29 minutes and 52 seconds left before the race starts!! 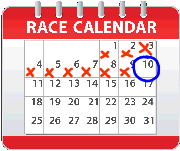 You have 110 days, 8 hours, 59 minutes and 52 seconds left before the race starts!! You have 124 days, 8 hours, 29 minutes and 52 seconds left before the race starts!! You have 138 days, 19 hours, 59 minutes and 52 seconds left before the race starts!! You have 144 days, 17 hours, 59 minutes and 52 seconds left before the race starts!! You have 145 days, 8 hours, 59 minutes and 52 seconds left before the race starts!! You have 146 days, 9 hours, 59 minutes and 52 seconds left before the race starts!! You have 160 days, 8 hours, 59 minutes and 52 seconds left before the race starts!! You have 172 days, 18 hours, 59 minutes and 52 seconds left before the race starts!! You have 173 days, 8 hours, 29 minutes and 52 seconds left before the race starts!! You have 181 days, 8 hours, 59 minutes and 52 seconds left before the race starts!! You have 187 days, 8 hours, 59 minutes and 52 seconds left before the race starts!! You have 187 days, 18 hours, 59 minutes and 52 seconds left before the race starts!! You have 194 days, 10 hours, 29 minutes and 52 seconds left before the race starts!! You have 195 days, 2 hours, 59 minutes and 52 seconds left before the race starts!! You have 201 days, 8 hours, 59 minutes and 52 seconds left before the race starts!! You have 237 days, 9 hours, 59 minutes and 52 seconds left before the race starts! !